Are you looking for a suitable picture book for the little princess in your life? Is she between the ages of 2 and 5? If so, I have the perfect book for you. 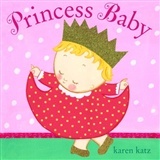 Princess Baby, written by Karen Katz, is a sweet picture book for children ages two through five. It is a charming story of a little girl who likes to dress up as a princess. Throughout the book, she insists that she wants to be called by her real name, not by nicknames like Cupcake and Sweetie Pie. The gorgeous illustrations are also the work of Karen Katz. This book is sure to appeal to preschool girls who love playing dress up. The little girl in the story has a sparkly crown, sparkly shoes, a royal wand and a velvet cape which make her feel like true royalty. This cheerful story book will fascinate young girls aged two to five. The large pictures are filled with vibrant colors and belongings that appeal to little girls. Among these are stuffed toys, a dress up treasure chest and a tea party set. Little girls will identify with the main character of the book. The text is just the right length to keep the attention of toddlers and preschoolers. We never do learn the child's name because at the end of the story, she wants to be called Princess Baby. The enchanting cover catches children's attention, while the story and wonderful, colorful pictures keep them enthralled. This would make a great gift for a young girl who is fascinated with princes and princesses. Karen Katz is a recognized writer of much loved children's books. She knows what little ones are fond of and does a tremendous job of writing and illustrating adorable children's books. Parents and children alike will appreciate Princess Baby. It is highly recommended for little girls aged two to five. Want more Princess Baby? Don't miss Princess Baby, Night-Night and Princess Baby on the Go!